When developing apps for Fire TV, you can choose from a variety of frameworks and options depending on your skillset (Java developer, web developer, or content developer), your platform preference (Android or HTML5 web app), the features you want (advertising, authentication, etc. ), and more. The information here will help you get started in building an app. Amazon Creator: Intended for content developers, Amazon Creator provides a simple browser-based interface where you can build an HTML5 web app for Fire TV in a matter of minutes. No coding is required. Amazon Creator automatically builds your app from the media assets and categories in your YouTube channel, Brightcove app, or Media RSS (MRSS) feed. Videos are grouped by your channel sections (for YouTube data sources) or by your feed item categories (for MRSS feed data sources). After you configure your feed, you can style the appearance of your app using the sidebar's visual editor to select colors, fonts, or background images you want. Learn more. Fire App Builder: Fire App Builder is a robust development framework created by Amazon specifically for producing Fire TV media apps. It is based on Java and uses Android Studio, Gradle, and other tools common to Android development. When you create an app with Fire App Builder, you configure the settings for your data feed, screen layouts, and functionality through a series of JSON files. Similarly, simple config file changes allow you to customize the look and feel of your app with no Java coding. Fire App Builder is designed to help you create high-quality media apps without advanced Java programming, but it is also extensible. If you are comfortable coding in Java, you are free to build on top of Fire App Builder to add more advanced features. Learn more. Custom Android App: If you're an Android Java developer, you can use Android tools (like Android Studio) and frameworks to build a TV app. Sample code, documentation, and guidelines are available to help you make the most of your apps. Most apps that work on Android will also work on Fire TV because Fire TV is built on Android. The only difference is with services — for Fire TV, you'll want to use Amazon services instead of Google services. Learn more. Custom Web App: If you're an HTML5 web developer, you can leverage the Amazon WebView to develop apps and games. You have the option to build HTML5 web apps, Cordova apps using the Fire OS port, or hybrid apps. Learn more. Game App: If you're building a game app, there are many third-party development frameworks that work with Android, so you have lots of alternatives to choose from. If you are proficient using Unity, Cocos2d-x, GameMaker, or one of the many other systems popular among mobile app developers, you will find it straightforward to package your game for Fire TV. If you can produce an .APK file, you can probably install it on Fire TV. To learn more, see these Gamemaker Tutorials. Tip: For an in-depth comparison between Web App Starter Kit for Fire TV (WASK), Fire App Builder, and Amazon Creator, see Development Framework Comparison. In choosing the right option, consider your skill set. Are you Java-based Android developer, an HTML5/web developer, or a content creator? Choose an approach that aligns with your expertise and app requirements. If you're developing an app for Fire TV and want a high-level overview to help you navigate the Amazon landscape, see the eBook How to Develop Media Streaming Apps for Amazon Fire TV. This eBook contains best practices for designing for a 10-foot UI, information on Amazon’s dedicated tools and templates (Fire App Builder, WASK, and Amazon Creator), details on publishing to the Amazon Appstore, and more. For Java-based Android developers, Amazon Fire TV uses the same tools, IDEs, and APIs you're already used to for Android development. To get started, see Fire App Builder, which is a starter kit for building Java-based Amazon Fire TV and Android apps. Fire App Builder is designed for streaming media TV apps (not games). Setting Up Your Development Environment: If you're new to Android development, this page helps you get started. Connecting to Amazon Fire TV Through adb: Connect your development computer to a Fire TV device over adb. Installing and Running Your App: Install, run, and uninstall your app on a Fire TV device for testing before you submit it to the Appstore. If you're an experienced Android developer, also check out this list of what's different about developing on Fire OS. If you're an HTML5 web app developer building a streaming media app, you can use the Web App Starter Kit for Amazon Fire TV (WASK). WASK is an open source project designed to get you up to speed quickly with a simple media-oriented app for Fire TV. This starter kit includes an example user interface designed for the 10-foot experience, support for the Fire TV remote control, and sample components that you can use to create and customize your own media app. If you're building your HTML5 web app from scratch, see Getting Started with Web Apps. In-App Purchasing API: When customers buy Fire TV devices and register with their Amazon accounts, they are already set up with their Amazon payment profiles and are ready to purchase apps or in-app items with no further effort. Amazon Fire TV and Fire TV Stick support the Amazon In-App Purchasing API, so you can offer consumable items, permanently entitled items, and even subscriptions for sale in your app. Amazon Fling SDK: The Amazon Fling SDK allows customers to fling or cast the screen that appears on their phone or tablet directly onto their television. Extending apps to two screens allows more than one person to engage with your app. To see more Fire TV APIs and SDKs, see Apps & Games Services SDKs. If you're looking for information about the media, device, and specifications Amazon Fire TV supports, such as video formats, DRM, codecs, resolution rates, and more, see Fire TV Device Specifications. Detailed developer specifications are available for each device. 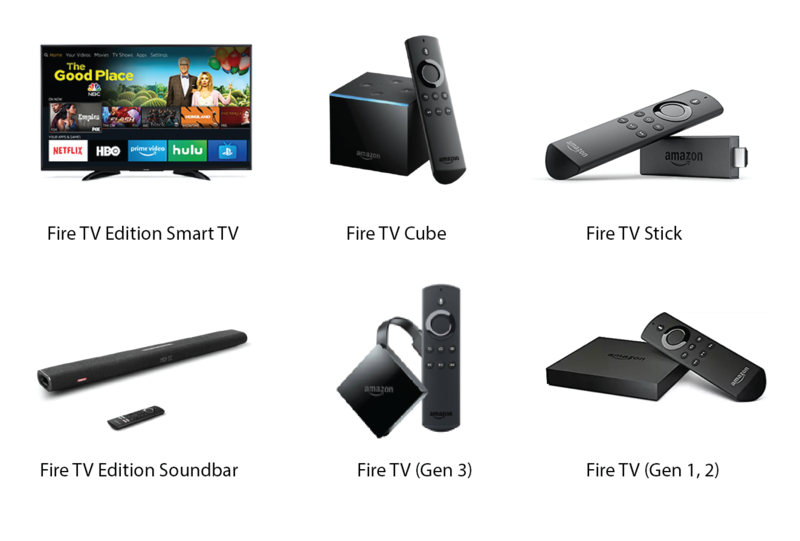 In general, Fire TV is flexible and provides high performance across a wide range of applications. It has a powerful quad-core CPU and a dedicated GPU. The hardware on the latest Amazon Fire TV offers 2GB RAM, 8GB internal storage, support for 4K video output, support for HDR, and Dolby Atmos audio. These features mean that Fire TV has the muscle to run all sorts of apps and games—streaming media is just one more thing it handles well. On Amazon.com, the device is called "Fire TV Cube | Hands Free with Alexa and 4K Ultra HD | Streaming Media Player." On Amazon.com, the latest version of Fire TV is called "Fire TV with 4K Ultra HD and Alexa Voice Remote (Pendant Design) | Streaming Media Player." The Gen 2 version is no longer available except as a refurbished device. Fire TV Stick 4K Refers to the 4K stick for Fire TV. Note that Fire TV Stick 4K is not "Fire TV Stick (Gen 3)." Fire TV Stick 4K will live alongside non-4K Fire TV Sticks as separate product lines. On Amazon.com, the latest version of the non-4K Fire TV Stick is called "Fire TV Stick with Alexa Voice Remote | Streaming Media Player." Refers to all smart TVs with Fire TV built into the TV hardware. If necessary, the specific model of Fire TV Edition is noted in the name, such as "Fire TV Edition - Toshiba 4K" or "Fire TV Edition - Element 4K." Otherwise, references to "Fire TV Edition" apply to all smart TVs with Fire TV built-in. For TV dimensions (e.g., 43", 50"), weights, stand details, and mounts, see the Comparison Chart and Tech Specs on the Fire TV Edition page on Amazon.com. On Amazon.com, Fire TV Edition - Toshiba 4K is referred to as "Toshiba 43/50/55-inch 4K Ultra HD Smart LED TV with HDR - Fire TV Edition." Refers to all versions/models of Fire TV devices (box, pendant, stick, smart TV). If you need help, have a question, or want to share other feedback, use the Fire TV and Fire TV Stick categories on the Amazon Developer Forum.